The One Direction heartthrob and the US pop singer were first linked together last month after they were spotted looking friendly back stage at the US X Factor and have since been snapped together in New York. Louis told Us Weekly: "I'm happy they're good friends." 1D's Liam Payne also revealed he's hung out with Taylor, "and she's a really lovely girl." 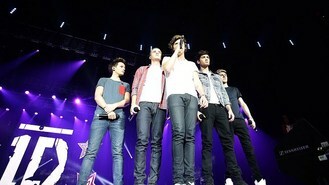 Meanwhile, One Direction and Taylor both performed at Capital Radio's Jingle Bell Ball in London at the weekend. While Taylor, 22, and Harry, 18, were careful not to be pictured together, sources told the Daily Mirror they were spotted holding hands as they arrived at London's O2 arena together.